In celebration of Women’s History Month and International Women’s Day, this is the third in a series of installments from Smithsonian Institution Archives staff highlighting women in science photographs. We will post portraits of women science here throughout the month. This week's installment of images focuses on “Science and the Family.” This group of photographs initially reminded me of a quote by Edith Wharton; “I don't know if I should care for a man who made life easy; I should want someone who made it interesting.” These images capture several women who refused to be limited to traditional female roles. Driven by intellectual curiosity and determination, their contributions in the sciences made them pioneers during a period of history when few colleges and universities would admit women into their institutions. I am the newest addition to the SIA reference team. My responsibilities as a reference archivist grant me the privilege and access to the variety of collections held by SIA which document the history of the Smithsonian and its scientific endeavors. 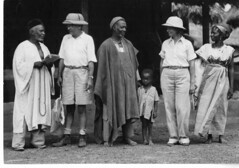 A recent inquiry, one of more than 5,000 we receive annually, concerned the 1940 Smithsonian Institution-Firestone Expedition to Liberia (a live animal collecting expedition) and the work of William and Lucile Mann. It seemed natural that William M. Mann, Director of the National Zoological Park (1925-1956) would lead the expedition I was not, however, familiar with the work of Lucile Quarry Mann. I discovered that this was not Lucile’s first zoological expedition; she was the only woman to participate in the 1937 National Geographic Society-Smithsonian Institution to the East Indies. Further study into the life of Ms. Mann revealed that she came to Washington D.C. in 1918 to work in military intelligence for the War Department. A gifted writer, she served as Editor with Women’s Home Companion from 1922-1926, was Editor of the Annual Report of the National Zoological Park from 1951-1971, and author of several books on animals. Another image in our collections which I find interesting depicts Charles Doolittle Walcott, the fourth Secretary of the Smithsonian institution (1907-1927,) his son Sidney Stevens Walcott, and his daughter Helen Breese Walcott. This image shows the Walcott’s on “vacation” in the Canadian Rockies. 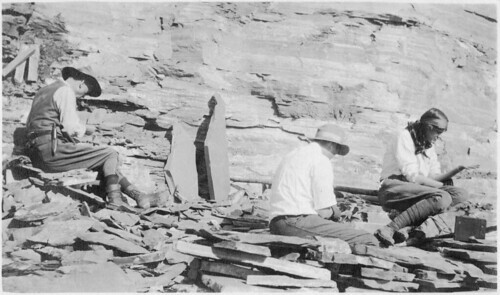 Paleontology was a family affair for the Walcott’s, and many summers were spent assisting father Charles in the field. This experience living minimally in rugged conditions almost certainly contributed to Helen Breese Walcott’s ability to travel across war-torn France, alone, in search of her fallen brother’s grave (Benjamin Stuart Walcott, a member of the Lafayette Flying Corps during WWI, was shot down over France in 1917.) Helen, in a letter to her father, describes her journey, which included enduring the weight of her soaken fur coat while pedaling an old rusty bicycle through streets of mud, spending evenings in makeshift beds of straw, and often relying on the kindness of strangers for food and shelter. Undeterred, Helen Walcott closes her letter stating, “I have done what I tho’t impossible so many times – what everyone en route doubted I could do.” Perhaps the women depicted in the “Science and the Family” images could have resigned themselves to a life of leisure or assumed traditional gender roles. Fortunately, their curiosities and family influences led them to pursue a career in the sciences, paving the way for future generations and the advancement of mankind.